Alipurduar: Chief minister Mamata Banerjee on Tuesday played the development card in the Dooars ahead of rural polls this year and accused the BJP of failing to keep its promise of reopening closed tea gardens, the region's mainstay. 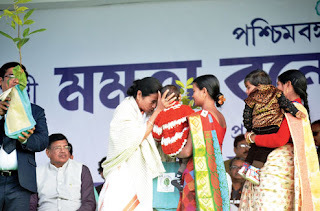 Mamata adopted the dual strategy while addressing a rally of around 50,000 people, mainly tribals and Gorkhas who form of the region's voters, as she reeled off welfare schemes started by the state. "BJP leaders all are liars. Prior to the general elections, they had promised that the Centre will acquire seven closed tea estates but till date, the Centre has not acquired a single one. People here should be on alert because BJP leaders are masters of conspiracy. They will trap and misguide people," Mamata told the public meeting in Uttar Parokata village, around 22km from Alipurduar town. "We feel for common people and thus, an array of development works has been carried out in Alipurduar, which was declared a new district only three years back," Mamata added. Aware of the proximity of Alipurduar district with Assam - the district shares border with the neighbouring state and the rally venue was only 10km from the border - the chief minister referred to alleged anomalies in drawing up the National Register of Citizens by the north-eastern state's BJP government. There are allegations that names of several Bengali-speaking residents have not been included in the NRC. "It is unfortunate and it should not happen. On the other hand, two years back, when distressed people from Assam came to our state during a law and order problem, we had provided food and shelter to them. This is our culture," she said. Mamata is counting on a churn in Alipurduar and the rest of the Dooars. "Her party leaders have managed to get most leaders of the Gorkha Janmukti Morcha in the Dooars into the party. This has been a major setback for the BJP as unlike other districts, in the Dooars, BJP had always banked on the Morcha to win polls. Mamata Banerjee has realised that she now has both the tribals and the Gorkhas, whose votes largely matters in the districts of Alipurduar and Jalpaguri, on board," said an observer. Chief minister Mamata Banerjee on Tuesday played the development card in the Dooars ahead of rural polls this year and accused the BJP of failing to keep its promise of reopening closed tea gardens, the region's mainstay.